Mike Greene For the Northwest Herald Crystal Lake South's Sara Mickow goes up for a rebound while surrounded by a group of Hampshire defenders during the third quarter of a game Friday, November 30, 2012 in Hampshire. Crystal Lake South defeated Hampshire 46-41. 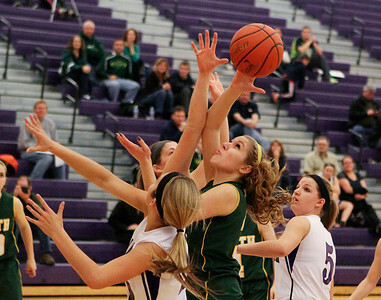 Mike Greene For the Northwest Herald Crystal Lake South's Sara Mickow (left) and Carly Nolan (right) surround Hampshire's Jenny Dumoulin as she drives to the hoop during the first quarter of a game Friday, November 30, 2012 in Hampshire. Crystal Lake South defeated Hampshire 46-41. 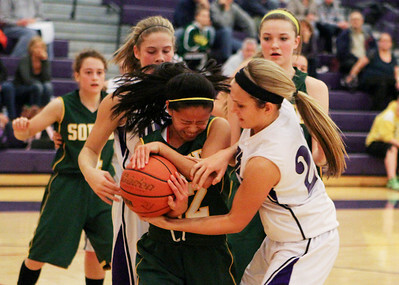 Mike Greene For the Northwest Herald Crystal Lake South's Gaby De Jesus (left) and Hampshire's Lizzy Panzica fight for possesion during the second quarter of a game Friday, November 30, 2012 in Hampshire. Crystal Lake South defeated Hampshire 46-41. Mike Greene For the Northwest Herald Hampshire's Jenny Dumoulin (left) knocks the ball out of the hands of Crystal Lake South's Sara Mickow during the first quarter of a game Friday, November 30, 2012 in Hampshire. Crystal Lake South defeated Hampshire 46-41. 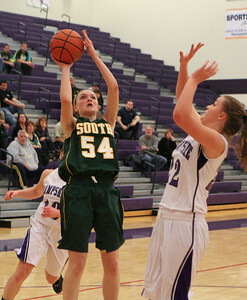 Mike Greene For the Northwest Herald Crystal Lake South's Sara Mickow puts up a shot during the first quarter of a game against Hampshire Friday, November 30, 2012 in Hampshire. 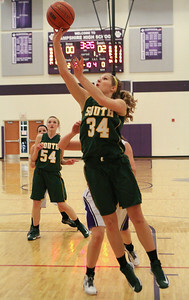 Crystal Lake South defeated Hampshire 46-41. Mike Greene For the Northwest Herald Hampshire's Emma Benoit is blocked from behing by Crystal Lake South's Michelle Fuchs while while shooting during the second quarter of a game Friday, November 30, 2012 in Hampshire. Crystal Lake South defeated Hampshire 46-41. Mike Greene For the Northwest Herald Hampshire's Tricia Dumoulin (left) and Emma Benoit (right) defend Crystal Lake South's Sara Mickow during the first quarter of a game Friday, November 30, 2012 in Hampshire. Crystal Lake South defeated Hampshire 46-41. Mike Greene For the Northwest Herald Hampshire's Tricia Dumoulin releases a shot while driving during the first quarter of a game against Crystal Lake South Friday, November 30, 2012 in Hampshire. Crystal Lake South defeated Hampshire 46-41. Mike Greene For the Northwest Herald Crystal Lake South head coach Kyle McCaugh talks to his team during a time out in the third quarter of a game against Hampshire Friday, November 30, 2012 in Hampshire. Crystal Lake South defeated Hampshire 46-41. Mike Greene For the Northwest Herald Crystal Lake South's Chanel Fanter releases a shot as Hampshire's Emma Beniot defends during the frouth quarter of a game Friday, November 30, 2012 in Hampshire. Crystal Lake South defeated Hampshire 46-41. 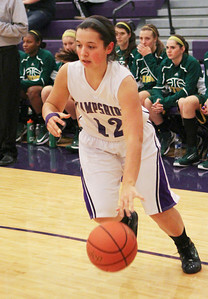 Mike Greene For the Northwest Herald Hampshire's Becky Dumoulin drives towards the basket during the second quarter of a game against Crystal Lake South Friday, November 30, 2012 in Hampshire. Crystal Lake South defeated Hampshire 46-41. 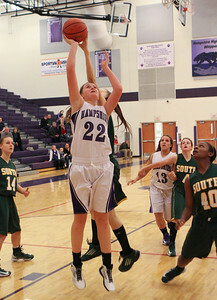 Hampshire's Emma Benoit is blocked from behing by Crystal Lake South's Michelle Fuchs while while shooting during the second quarter of a game Friday, November 30, 2012 in Hampshire. 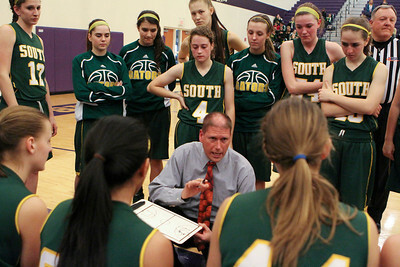 Crystal Lake South defeated Hampshire 46-41.